If Senate Republicans wondered how their health care fiasco was playing out in the rest of the country, they aren't wondering anymore. Tuesday night, in a GOP runoff race in Alabama, voters unleashed on the Republicans who've failed to deliver on their single-most important promise of the decade: repealing Obamacare. Senator Luther Strange (R) bore the brunt of that backlash yesterday, losing his primary bid to conservative Judge Roy Moore. For Strange, who was caught in the crosshairs of the base's clash with Republicans, the outcome couldn't have been a surprise. Despite outspending Moore 3-to-1, no amount of money could overcome conservatives' frustration with business as usual in Washington. For Senate Republicans, Strange's loss is just a harbinger of things to come if leaders don't start demanding some cohesion on key issues. "If you're an incumbent, you have to assume the wind is against you," one political consultant warned. "If you do run, you take nothing for granted and leave nothing on the table. You start out with one big strike against you: You're an incumbent Republican senator." I could not agree more. While the former attorney general of Alabama may have been the candidate, the outcome was the product of the Republican majority that hasn't been able to move the conservative agenda down the field. Americans have watched in disbelief as the party they entrusted with the White House and both chambers of Congress takes a knee on seven years of promises on everything from health care to Planned Parenthood. Now, despite months of reassurances, Cecile Richards is crowing about Planned Parenthood's victory over weak-kneed Republicans. That's absolutely unacceptable, and -- as voters made quite clear yesterday -- the clock is ticking on the rest of the party to get its act together. The Senate's unemployment line will only get longer if the administration doesn't push members to work aggressively within the conservative agenda. Obviously, some of this is outside the White House's control. They can't speed up the confirmation process or single-handedly overturn Obamacare. But the president has been most successful when he aligns himself with the core conservative base. That's how Trump won the election, and it's how he's made the greatest progress for change. Right now, the Washington Examiner's David Drucker points out, "There's a very clear divide developing between how Republicans feel about the president and how they feel about Congress." But if the Senate doesn't wake up and rein in its "bunch of free-range chickens," as Senator John Kennedy (R-La.) called them, the base's discontent will start bleeding into the administration too. Ultimately, voters will just start checking out. And that would spell disaster for the GOP, wrote a disgruntled Deroy Murdock on NRO. "Come 2018, the Republican Party will need these patriots to knock on doors, man phone banks, attend get-out-the-vote rallies, and of course, cast ballots. Watching Republicans stagger from one self-inflicted defeat to another will unleash a pandemic of learned helplessness on the Right. If repeatedly campaigning hard for Republican candidates achieves so little, why knock ourselves out a year from now?" "It would be bad enough to watch Republicans on Capitol Hill fight valiantly and lose to Democrats. But for these lazy, vacation-addicted dilettantes to surrender to themselves is beyond revolting." For now, the second biggest winner from last night's runoff is almost certainly Democrats, who are rubbing their hands together at the thought of another Republican civil war. The GOP's will only make it easier for liberals to bounce back after a disastrous 2016. In the meantime, let's hope Roy Moore's victory echoes throughout the country and helps bring an end to the Senate's trail of broken promises. 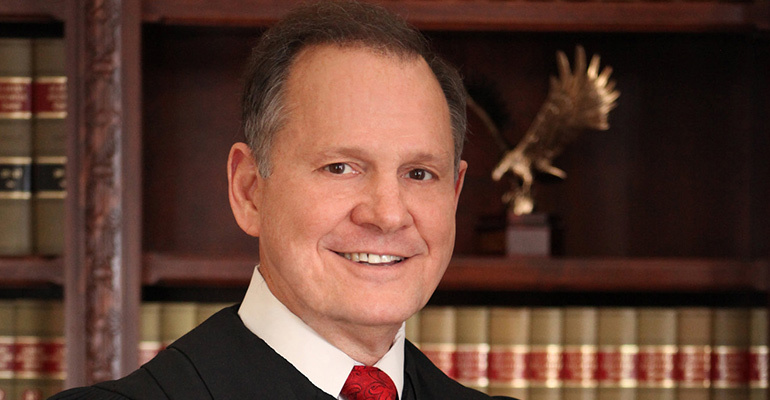 We congratulate Judge Moore and look forward to working with him to break Washington's cycle of dysfunction.